This magazine is produced by folks down in Australia, but don’t let that discourage you from giving it a look. Oh, did I mention that it can be downloaded online for free? You can download the first issue by clicking HERE. 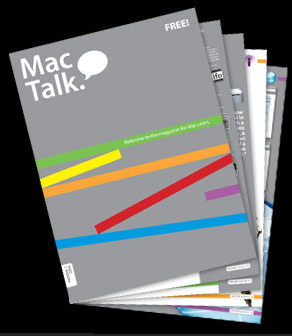 Thanks to the Silver Mac blog for its post about this new magazine. It means making products that everyone can use – including Mac users. We want to provide great products and services to the tens of millions of Mac users around the world, because it’s the right thing to do, and because Mac users inside and outside Google demand it. Source: “Everything Google for the Mac” by Devanshu Mehta published at the AppleMatters blog. Would you like to have the ability to turn a web page or a text file into an eBook to use on your iPod? The iPod Notes Packager will handle this transformation for you quickly, easily, and free. You can choose any website or any text file, upload it to this site, and within a few seconds have your very own eBook. This site could be used for Court rules, statutes, legal outlines, “to do” lists, client names and addresses, or many other uses for attorneys. Even better, it can serve as a legitimate reason to justify purchasing an iPod through your firm. And did I mention that it’s free? You can check out The iPod Notes Packager website by clicking HERE.